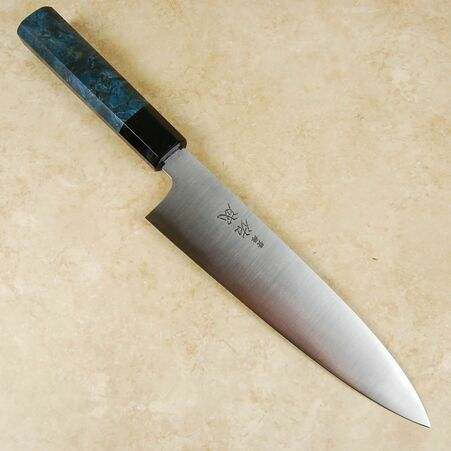 Hanyaki Toukichi made his name as a bladesmith working for famed Japanese knife maker Masamoto. It was during this time that he learned the traditional processes of forging and knife making. He left the company in 1933 to found Sukenari, which is currently located in Toyama Prefecture in the center of Japan. The Sukenari company principle is to make and sell the best kitchen knives to professional chefs across Japan. They do this directly, which allows them to receive feedback and thus to refine their methods and designs for the betterment of their esteemed clients. This was the original way of selling in any industry and we were impressed to find that the craftsmen and forge-smiths who make these blades are also in charge of sales. The Sukenari blacksmiths are famed for using the best steels available and for their impressive abilities at the forge and grinding wheels. The AS Hairline Gyuto is a perfect example of these abilities. 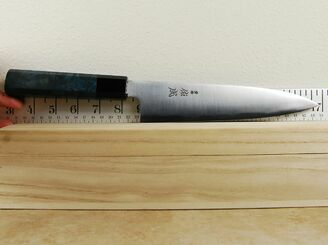 Using Aogami Super steel as the core gives the knife a wonderfully sharp and hard edge. It is clad with a softer stainless steel layer which adds strength and reduces maintenance requirements. The edge is still very reactive so it does need care with washing and drying between uses. The outer layer is presented with a hairline, or brushed, finish. It is very subtle yet very handsome. The profile is fairly tall in terms of length-to-height ratio. 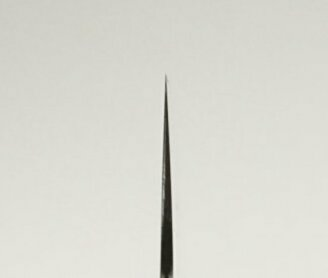 The profile has a flat area from the heel with a mild belly to the fine tip. There is also a very nicely realized distal taper. 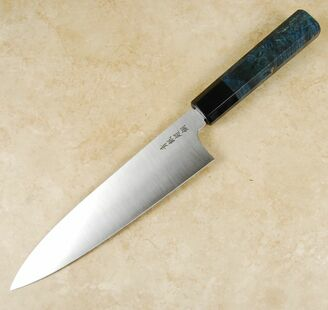 All around this is a great gyuto with exemplary fit and finish and beautiful custom handle to match. What s the weight of the knife?